You can buy all kinds of business and technology research; I spent years buying research, almost $2 million in contracts over 10 years. But for obvious reasons, the research firms are not doing evaluations or best practices about their own work: about the art of being one of their customers. Research is the art of finding subject matter experts and adding to your own expertise. It’s facts and figures, yes, but at its best, it’s also insight and “aha” moments. But for many, it’s not something that happens all the time, and the “expertise of finding and becoming experts” is limited. At its worst, technology research is a wasteful CYA exercise. Are you spending smart? Are you measuring the right things? A lot of money is spent on contracts with Gartner and Forrester and their competitors; are you confident you’re spending the right amount in the right place, for the right results? In my opinion, the obvious metrics--number of engagements, reports pulled, users signed up--are essentially meaningless. Months of work with a contracted analyst may lead you to make a faster version of a paper form, instead of a better business process. Unwittingly, you might have gotten just what you asked for from your research, and thought you had been served well. Because in traditional measurement, that bad work might show up as terrific engagement for the research company. As consumers, we have taught research companies to perpetuate that issue; being genuinely engaged with a client, especially if it means saying something they might not want to hear, does not feed the contract renewal machine. One really meaningful insight based on thoughtful dialog between you and an expert can make millions of dollars of bottom-line difference, and still show up as a measurement blip. At its heart, research is a subjective field. You’re going to have to trust yourself--and your staff--that they know value when they see it. This does not suggest that research is all touchy-feely. This article presents a framework to help you think about research as a business-linked process. It lays out the fundamental parts of those ties, and includes a chart to map research needs for yourself, your team, or your company. Is the work strategic or tactical? Are you planning things, or making things work? Is the focus horizontal or vertical? If many people come to you to solve a similar need across many departments, your focus is likely horizontal. If you bring together people from many departments to achieve something that wouldn’t happen without that coordination, you’re more vertical. 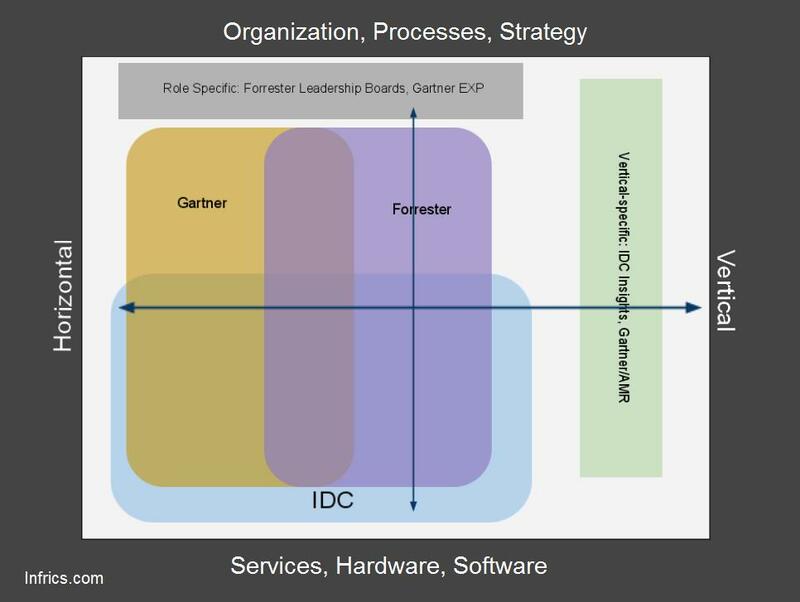 A datacenter manager is tactical-horizontal, a marketing manager is strategic-vertical. Your plant manager is tactical-vertical, your legal department is strategic-horizontal. We can now chart that, and get a “research personality map.” Where would you land? Seeing the business this way can help you ask better questions of a potential research vendor. In my previous role, it was my job to analyze the research needs of IT organizations and recommend research as a portfolio to offer the best possible combination. This map shows Gartner, Forrester, IDC, and AMR (acquired by Gartner in 2010) plotted against the same criteria; it represents my opinion of their coverage and strengths based on experience. This is not a complete list of research companies, and certainly not a complete list of the expertise resources. It’s an example of some of the largest. In my opinion, there is much excellence in the research world, much hype and some laziness. The idea here is to help you tell them apart, be more resourceful, and be a better shopper. Map your work and your interests to the right research tools. - and other information streams that let you do research if you don't have a big budget.